The Iowa chapter of the American Institute of Architects (AIA Iowa) will host this seminar and reception to strengthen your understanding of media relations and help you learn to think about the design process as a story with a beginning, middle and end for clients, how to use social media to establish yourself as a content expert and how to raise the profile of the profession in conversation. 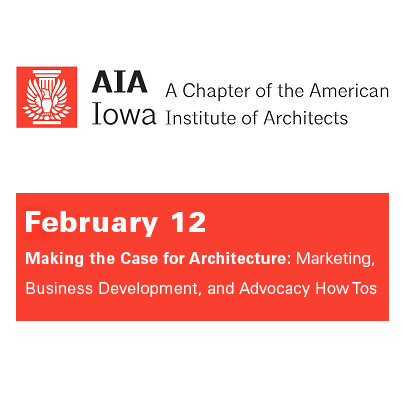 Interact with the presenters, AIA Iowa members, faculty and students at a reception with heavy appetizers following the seminar. When: Seminar: 1-4 p.m., reception: 4-5 p.m. Architecture is both creative and analytical, combining rigorous thinking with flights of imagination. But too often it’s covered in the media as if its purpose were merely to provide illustrations for stories about real estate deals. Learn how to discuss the design process as “A Hero’s Journey.” Half the cool characters in movies are architects (or smugglers) — let’s talk to non-designers so they can better understand how cool this profession really is. Attendees of this workshop will learn how branding, community involvement and social media can be utilized for marketing and business development for themselves and their firms. 1. Strengthen your understanding of media relations. 2. Think about the design process as a story by identifying the beginning, middle and end for your clients. 3. Use social media to establish yourself as a content expert. 4. Raise the profile of the profession in conversation.